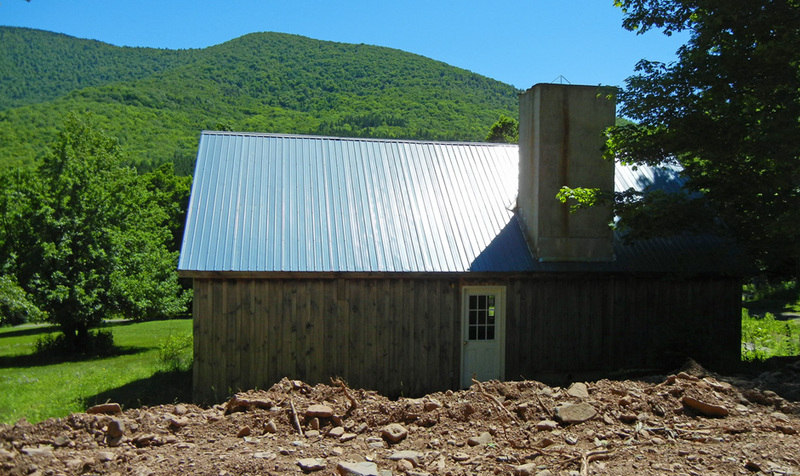 To reach the future home of West Kill Brewing, you drive six miles down a dead-end road. Spruceton Road is a gorgeous rural route, showcasing wide-open mountain views, creeks and a diverse variety of flora and fauna, including an occasional mink. Several of the Catskills’ most popular hiking trails have access points along the way. At the moment, those trailheads and the two-year-old Spruceton Inn tucked into a field at the foot of a mountain are the two big draws for visitors to these Greene County woods. But come next summer, beer-lovers will have a great new incentive to venture to West Kill, where Mike and Colleen Barcone are transforming part of a 127-acre family farm into a brewhouse and tasting room. It’s the realization of a long-planned dream that’s finally entered the execution phase, after solving many infrastructure challenges and considering several Plan Bs. The new building will house a 10-barrel system whose equipment is under construction at a specialty manufacturer on the West Coast, scheduled to arrive in November. Not too long after that, the couple hopes to begin production on six to eight beers they have been developing and testing for several years. Wholesale distribution to Catskills restaurants will happen first, with the retail operation coming online several months later. “We want the tasting room to be a real showpiece, so we are taking our time to do it right,” Mike said. West Kill Brewing’s product line will focus on farmhouse-style beers, built around ingredients grown on-site or nearby, and foraged locally. Their ingredients include syrup produced by Sugar Moon Maple, a family business started by Mike’s uncle in the 1980s, as well as fruit grown in the brewery’s orchard. Both the sugaring house and the fledgling orchard adjoin the future tasting room, where patrons will be able to wander the grounds sipping beers made from the sour cherries, elderberries, blackberries, lingonberries and apples growing there. Bee hives provide both pollination and honey. The couple has also experimented with mushrooms, spruce tips and other locally foraged foods in their recipes over eight years of home-brewing. Helping to complete the production cycle, six pigs consume the spent grains from the brewing process. There will be occasional forays into other beer styles, including IPAs and stouts. Mike, the main brewmaster, is particularly interested in the role that wild yeasts play in fermentation and flavoring. Without diving too deep into beer nerdiness, suffice it to say he knows what he’s doing, and the outcomes are delicious. Neither of the Barcones set out for a career as brewers. The couple met at college in Boston, where both studied to be teachers. While living in Boston, they found themselves leaving home every weekend for hiking destinations around the Northeast, often popping into local breweries for a pint. The combination of beer and outdoor adventures held a lot of appeal. Acknowledging that careers in urban education were at odds with their love of the mountains, the couple began hatching a plan to move home to the Catskills and start a business at the farm, which has been in the family since the 1920s. They originally planned to partner with Mike’s father, Tim Barcone, who ran Barcone’s Music in Kingston and passed his entrepreneurial spirit on to his son. Before that plan was realized, however, both Mike’s father and Colleen’s father passed away within six months of each other. West Kill Brewing was born out of those losses, the Barcones say. Once production is up and running, West Kill Brewing’s overall business plan calls for about 60 percent of its sales to be wholesale kegs and 40 percent take-home growlers and 750-ml bottles. The tasting room, which will be fashioned from an existing cabin, will feature an indoor bar and seating area, a fireplace and two decks — one facing the sunny, panoramic view of West Kill Mountain across Spruceton Road, and the other in a shady spot between the tasting room and the brewhouse. While beer will be the star of the show, the menu will also include a small selection of snacks such as local cheeses, charcuterie and pickled vegetables. The Barcones plan to host special events, such as food truck nights, and collaborate with the proprietors of Spruceton Inn, the neighboring nine-room “bed and bar.” They are also hoping for some foot traffic from the nearby hiking trails, and plan to sell “crowlers,” a lightweight, non-breakable metal version of a glass growler that’s more adaptable to outdoor activities. “We’re right at the end of Devil’s Path, and I don’t care how stinky you are, you can come in and have a beer,” Mike said. Related: Read more Catskill Eats coverage of Catskills beer and breweries. Want more Catskill Eats? Please join us on Facebook, Twitter and Instagram for breaking news and more photos. Got a tip to offer? Drop us a line here. Dear Catskill Eats readers and friends: it's been a great run for two and a half years. And now it's time for a change of pace. I'm heading south for the winter, and the blog is going on hiatus, at least for a while. Thanks to everyone for following and sharing and tagging to help promote local Catskills food and drink.